Travel to Denmark and explore the picture-perfect scenes Scandinavia boasts in abundance. Denmark is a Nordic country found in Northern Europe, located to the south west of Sweden, to the south of Norway and to the north of Germany. It's a beautiful country famed for great food and a rich maritime heritage. Copenhagen is arguably the top attraction for tourists to Denmark but for reasons most likely to due to economics there isn't a great deal of choice when it comes to ferry services here. The following guides explain how to get from the UK to Denmark by ferry (or cruise ship) from different parts of the UK. Route closure: On 30th April 2014 DFDS Seaways announced the closure of the Harwich to Esbjerg route which was effective as of the 29th September 2014. The line blamed strict sulphur emission limits in a new environmental law for adding an estimated £2million of annual costs to the operation of this route. The route first started back in 1875 and is closing after 139 years of operation. It is unknown as to whether the route will ever be reinstated though I expect it most likely will not as this route was suffering from dwindling passenger numbers and it is highly likely that freight will be moved elsewhere in the network or through other operators. For details of alternative ways to get to Denmark check out this guide from DFDS °. Sailing to Esbjerg from Harwich is simple and efficient.The route moves a lot of freight cargo but is also highly popular with car, caravan and camper van drivers who want to explore the magnificent Danish country. 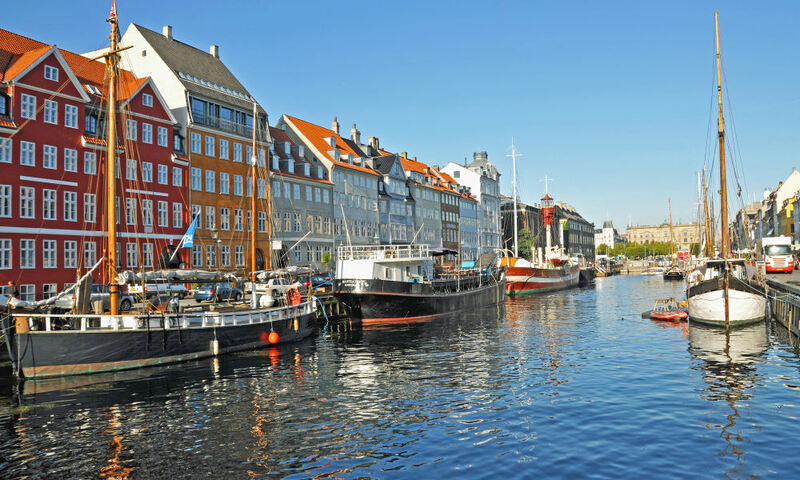 With excellent road links, great cities to explore such as Copenhagen and world-class attractions such as the original LEGOLAND Billund, there is plenty to see and do here. Whilst the ferry crossing is fairly lengthy, it is an overnight service which means you are asleep during most of the sailing. For the part you are awake there's plenty to do on the friendly, cosy yet comfortable Sirena Seaways. For a 1615hrs departure, check-in opens at 1400hrs and closes at 1530hrs. For a 1715hrs departure, check-in opens at 1530hrs and closes at 1630hrs. For the later 1745hrs departure, check-in opens at 1530hrs and closes at 1700hrs. You will need to take along passports for everyone travelling in your party. You can find more information on who needs passports and to apply for them on Gov.UK. Check-in takes place in the main passenger terminal building adjacent to the railway station. The DFDS Seaways office is tucked off to the left hand side in a small office. The Stena Line check-in desks draw the focus here so this tiny office looks a bit lonely in comparison. There's a quiet departure lounge a bit further beyond the office and whilst it does benefit from being secluded it suffers from a lack of announcements so you'll need to keep your eye on the time so you're ready to board. The terminal has a small café for light refreshments which can be found opposite the Stena Line check-in desks. Once boarding commences a short queue normally forms. Passports and boarding tickets are checked before you head through a security check area. A random spot check system is usually in place meaning security staff will pick a random selection of bags to check. Once you are through this area you then proceed onwards through a walkway that takes you directly onto your ship, the Sirena Seaways. The Sirena Seaways is a cosy vessel, built to carry a large volume of cargo. Whilst the passenger decks are relatively small compared to King Seaways or Princess Seaways, there's still plenty to do on-board and the service from the tight-knit crew is very personable. This ship sails alone on the Harwich to Esbjerg route and so there isn't a daily service but one service every two, three or four days instead depending upon the season. Arrival into Esbjerg is at 1300hrs. The port is well placed to the south of Denmark affording it great connections for onward road journeys to Germany, northern Denmark or further afield to Scandinavia. Sweden, for example, is just a short road journey beyond Copenhagen. You really can't visit Denmark and not visit LEGOLAND Billund (I'm a big kid at heart). This theme park is just 40 miles (about 64 kilometres) by road from the port and is great for kids of all ages. Tip: Catch the modern cruise ferry from Copenhagen to Oslo ° to explore Norway. Speaking from experience it is possible to walk from the port to the centre of Esbjerg. There are public service buses that run across Esbjerg should you rather not walk. There's a handful of attractions in the city and it is a great choice for a short break. Esbjerg has a very strong maritime history and so you will find nautical themed museums and attractions. Fanø is an island in Denmark that is right across the water from the port of Esbjerg and is a popular attraction for wildlife buffs and photography enthusiasts in the Autumn as the birds migrate. Check-in opens at 1400hrs and closes at 1630hrs for the 1715hrs departure. For departures that leave at 1845hrs then check-in opens at 1500hrs and closes at 1800hrs. Arrival into Harwich is at 1300hrs the following day. Kiel in Germany is around 150 miles (about 241 kilometres) from Esbjerg, around 2½ hours by car. Odense in East Denmark is 87 miles (about 140 kilometres) away which would take up to 1¾ hours to get to in a car. Copenhagen is 188 miles (about 303 kilometres) away which is around 3¼ hours by car. Travel a tiny bit further and you're in Sweden as Malmö (208 miles (about 335 kilometres) from Esbjerg, 3½ hours by car). Harwich International Port is located 2.5 miles (about 4 kilometres) from Harwich town which takes about 5 minutes to travel by road depending upon the traffic. Colchester is around 19 miles (about 31 kilometres) away from the port which is a 30 minute car journey away. Ipswich is around 24 miles (about 39 kilometres) away from the port which is a 45 minute car journey away. London is about 86 miles (about 138 kilometres) away and would take up to 2 hours to reach by car or train from the railway station next to the port. You can reach Denmark by road if you first sail to the Netherlands. I've covered this in a separate guide. From Ijmuiden, Rotterdam or Hook van Holland you'll need to head north east towards Germany. As you transit through Germany you will need to head north towards the Danish border which is the gateway to Scandinavia by road. You can reach Denmark by road if you first sail across the channel to Calais or Dunkirk and drive up through France, Belgium, The Netherlands and Germany. Eurolines run a scheduled service from London to Copenhagen or from London to Aalborg. On the London to Copenhagen service the coach runs from London Victoria Coach Station via Dover to Amsterdam through France and Belgium. Here you change service and continue onwards to Copenhagen through Germany stopping at Rodby before arriving at Copenhagen. This route takes around 24 hours to complete but it does take in several countries, albeit fleetingly. The coach stops at Ingerslevsgade (behind Central Station) in Copenhagen. The London to Aalborg takes in a few more stops. It too runs from London Victoria Coach Station via Dover to Amsterdam through France and Belgium. Here you change service and continue onwards to Hamburg in Germany where you will change onto yet another coach. From here you'll travel onwards into Denmark calling at Kolding, Vejle and Aarhus before finally arriving at the Eurolines Coach Station in Aalborg. The London to Copenhagen route is a daily service and departs London late in the evening and departs Copenhagen early in the morning. The London to Aalborg runs three times a week, again departing London late in the evening and departing Aalborg early in the morning. You can book your tickets here.